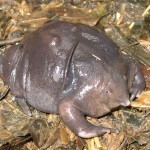 The Desert Rain Frog is a small, plump species with bulging eyes, a short snout, short limbs, spade-like feet and webbed toes. 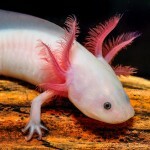 On the underside, it has a transparent area of skin through which its internal organs can be seen. 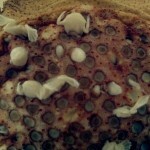 Its color is yellowish-brown and it often has sand adhering to its skin. 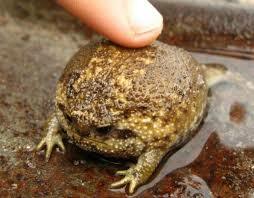 Oh, and it’s the cutest little frog in the world, in my opinion. What do you think? 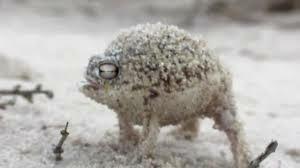 Photographer Dean Boshoff recorded a short clip of the high-frequency defensive cry of the Desert rain frog (Breviceps macrops) while walking along the sand dunes in Port Nolloth, a coastal town in the Northern Cape province in South Africa. He dubbed it “its fearsome war cry.” Check it out. This video has gotten over 9 million views on YouTube and has been covered by CNN. You’re going to love this. 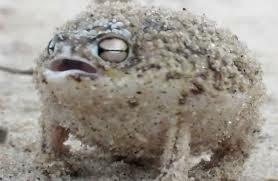 The desert rain frog is regularly found along a coastal strip of land about 10 kilometers (6.2 mi) wide in Namibia and South Africa. This area of sand dunes often has sea fog rolling in which supplies some moisture in an otherwise arid region. 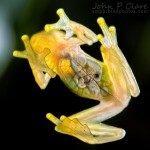 The locations in which this frog is found have at least one hundred foggy days per year. 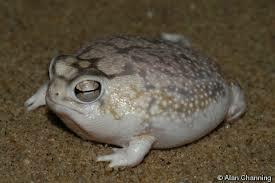 The desert rain frog is listed as “Vulnerable” in the IUCN Red List of Threatened Species. 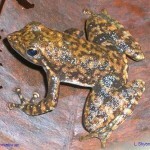 Its total range is smaller than 2,000 square kilometers (770 sq mi) and is fragmented and the number of individual frogs seems to be decreasing. It is threatened by habitat loss caused by opencast diamond mining, road making and increased human settlement. MY QUESTION FOR YOU TODAY: What do you think? Cutest frog ever? Feel free to share your videos of how your animals react to hearing this frogs mighty war cry! I would love to see that and I will publish them here! 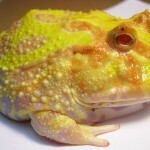 I’m always amazed at the different kinds of frogs that exist. It’s certainly a species with a lot of variety in it. Thanks for introducing me to yet another interesting member of the family. I was considering getting my 12 year old son a frog but my husband said not to because they die easily. But yes, I agree that the frog is adorable. Have you ever heard of sugar-gliders? They are somewhat unusual and you could do a post on them if you ran out of ideas. =) You seem so interesting!